One of the leaders in the evolution of NCAA women’s basketball. College basketball official from 1964-84. Officiated the NCAA women’s basketball tournament for the first three years of its existence (1982, 1983 and 1984); worked the championship game in 1982 and again in 1984. NCAA women’s basketball secretary-rules editor, 1985-1997. Supervisor of women’s basketball officials for the Big Ten conference, 1984-88. Named the first-ever NCAA national coordinator of women’s basketball officiating, 1996-2005. Weston was the first woman to receive both the NASO Gold Whistle Award, officiating’s highest honor, and the Mel Narol NASO Medallion. 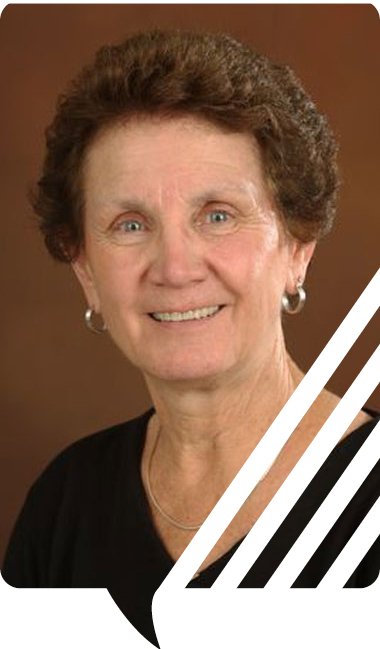 In addition to her work in basketball, Weston was heavily involved in Central Michigan University athletics, serving as field hockey mentor from 1972-74, women’s basketball coach from 1974-76 and women’s volleyball coach from 1974-1988. Her volleyball teams won four straight titles from 1997-80 and her 1981 team went 54-14, setting a school record for wins in a season of any sport. She also served as an administrator in Central Michigan University’s athletic department. Weston was a member of the NASO board of directors from 1999-2003, serving as chair in her final year. She’s a founding member of the Officiating Development Alliance, a group of collegiate and professional officiating supervisors that shares best practices in officiating across various sports. Weston has received numerous awards for her contributions to women’s athletics, including the 2013 Naismith Women’s College Officials of the Year award, and she was inducted into the Women’s Basketball Hall of Fame in 2000. Marcy Weston appeared in a feature article in the August 2008 issue of Referee Magazine.